A Holter monitor is a machine that continuously records the heart’s rhythms. The monitor is usually worn for 24 hours during normal activity. Electrodes (small conducting patches) are stuck onto your chest and attached to a small recording monitor. You carry the Holter monitor in a pocket or in a small pouch worn around your neck or waist. The monitor is battery operated. While you wear the monitor, it records your heart’s electrical activity. You should keep a diary of what activities you do while wearing the monitor. After 24-hours, you return the monitor to your doctor’s office. 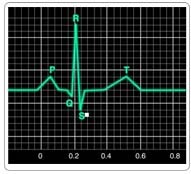 The doctor will look at the records and see if there have been any irregular heart rhythms.It is very important that you accurately record your symptoms and activities so that the doctor can match them with your Holter monitor findings. There is no special preparation for the test. Your doctor will start the monitor. You’ll be told how to replace the electrodes, should they fall off or become loose. Tell your doctor if you are allergic to any tape or other adhesives. Make sure you shower or bathe before you start the test. You will not be able to do so while you are wearing a Holter monitor. This is a painless test. However, some people may need to have their chest shaved so the electrodes can stick. You must keep the monitor close to your body. This may make sleeping difficult for some people. You should continue your normal activities while wearing the monitor. Normal variations in heart rate occur with activities. A normal result is no significant changes in heart rhythms or pattern. Abnormal results may include various arrhythmias. Changes in the normal pattern of waves formed by the heart’s electrical signals may mean that the heart is not getting enough oxygen. There are no risks associated with the test. However, you should be sure not to let the monitor get wet.